In this case that is some repairs and relaxation. After leaving the Mansfield rally, we headed straight to our dealer in Delta, OH. 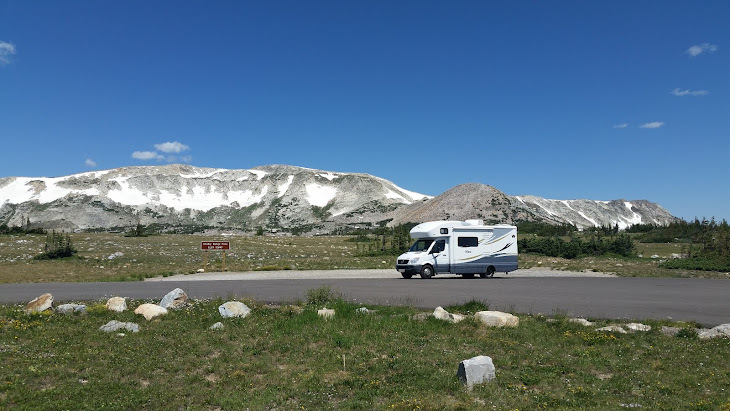 We bought the motorhome from them and feel that they have that magic combination of skill and honesty that can be relied on to get the job done. We have been having a problem with the bedroom slide creeping in every few days a couple of inches. I have searched for leaks but could not locate any. I also checked the fluid reservoir and was able to add almost a quart of fluid to get it to the middle of the dip stick. This did not solve the problem. We also had lost our satellite signal a few weeks ago and I found that the cable coming out of the covered roof dish was rusted through and I felt that there were going to be issues inside the cover. Finally, there was an intermittent problem with the right rear brake and running lights. The satellite was repaired by replacing the internal and external signal cable connections. A careful search of the hydraulic system revealed that the system was tight with no leaks to be found. They concluded that there was either dirt in the bedroom slide solenoid or a internal leak allowing the fluid to slowly drain back into the reservoir. In either case, they felt that it would not lead to a catastrophe failure of the valve and leave me stuck. If I could live with the slide creep, I could keep moving. I decided to live with it until the fall service. I will likely replace the valve at that time. As so often happens, the seemingly simplest problem, the lights, was the most annoying to fix. The connection between the cable run and the rear light was failing and several panels had to be removed and wires pulled to replace the connectors and then reassemble. Next we moved to one of our favorite campgrounds, Maumee Bay State Park, along the shores of Lake Erie east of Toledo, OH. In the week we have been here, we have been busy visiting with friends and getting some flash back from our years living in the area. We also squeezed in some dog maintenance. One of those flashbacks was to visit the marina where we kept our sailboat. In those days, there was barely an empty slip and activity of some kind every day of the week. On our last visit we found that the owners were going to go under and later we received an announcement about a new start up with new management. So a few days ago, we stopped by and found a rather sad looking place. One thing I do not miss is the Mayflies and they are still here in force. Still it brought back fond memories of the time spent here and on the water of Lake Erie. We can only hope that things improve enough to bring boaters back. Our Winnebago rallies are fun-no question about it. When like minded folks gather to talk about RVing and meet old and new friends, the fun just follows. This summer state rally in Mansfield, OH was hosted by the Ohio chapter that we still belong too. There were around 65 coaches at this event. There was a dinner out the first evening to get things going at a local inn that is part of a state historic site. The food was good and at least one person let his eyes order more food than his stomach good take. He took a bit of ribbing about the amount of food he ordered, but I suspect that he had the last laugh while enjoying the leftovers later. The rest of the event included a dinner prepared by our club along with catered breakfasts and a catered dinner. There were also games, crafts, an auction, and general bull sessions. A few years ago, happy hour was added to the list and has become a very popular event. A good time was had by all, but a few also managed to entertain the rest us. The last morning, as many started to head out, we and a couple of friends visited historic Mansfield, OH to take a spin on the carrousel. The carrousel had provided everyone in the rally with free tickets. This carrousel was opened in 1991 and is the first hand carved carrousel to be built in the United States since the 1930’s. This made us feel like kids again, including free popcorn for fathers, since we visited on Father’s Day. After leaving Frankfort, KY, we spent a hectic five days in Dayton, OH looking for a rental house for our daughter Katie, who will be spending three years there getting her Doctorate. We now have a good feel for the house rental market there. Then we headed north to Mansfield, Oh for the summer state rally of the Winnebago owners club. It was great to get together with our friends from the club. One of the highlights of the rally was a tour of the Ohio State reformatory. This proved to be a very interesting place. Built in the late 1800’s to provide humane and inspirational control of underage nonviolent offenders, it was a model for other such facilities around the country. The original building was so well designed and built that on the second floor the morning sun will shine thru two windows on the west side of the building and just miss the door jams and make a X of light in the center hall way. The front portion of the building contained the living quarters of the warden and guards. It also contained a luxury suite that housed dignitaries including the Governor and other celebrities. After serving as a reformatory for a number of years, it then continued as a state prison until 1990. The first prisoners were used to complete the prison cell houses. The first were made of brick and iron and the east and larger wing was built of free standing steel cells, six tiers high. The east wing, while occupying the same foot print as the older west wing held three times as many prisoners. This steel prison remains the largest free standing prison in the world. When the prison closed, the state intended to demolish the structure. A conservancy group stepped in and prevented the destruction of the building. Unfortunately, there is no funding for restoration and it remains in poor condition. Fortunately tours are still conducted and everyone is warned about the existence of asbestos and lead paint that may be found almost everywhere. The north section of the original compound is off limits, as a new high security prison remains on site where the exercise and recreation area was previously. This place is more famous than I would have suspected, as it has been used in numerous movies including Air Force One, Tango and Cash and the Shawshank Redemption. There are still many remnants from these films still visible. The car wash from the Shawshank Redemption along with many of the rooms and cells used, which are marked and have pictures of how they looked during the movies. From Air Force one, the gate and courtyard where the general was released to board the helicopter along with a number of the movie props. Our guide was very informative and funny. This site is worth going out of your way to visit. We rounded out time in Frankfort Kentucky with several diverse visits. First, we toured the Buffalo Trace Distillery and learned about how they made their version of Kentucky sour mash. Unlike so many productions tours these days, pictures were allowed and we were able to mingle with the workers at several of the stops on the tour including walking among the bottling team as they filled the flasks for several types of bourbon, including their most expensive 20/25 year aged single barrel bourbon. The most important part of the process is the aging in the wooden casks, where the bourbon takes on its taste. Under Kentucky law, bourbon cannot be called straight bourbon if it contains any colorings or flavorings that do not come naturally during the aging process. There are many details of the aging process that affects the final taste. While their many advanced techniques to produce the best results, the basic formula and experience of the staff are the critical factors in having exceptional bourbon. One of these is the tasting section, where those with exceptional palates ensure that the taste of each batch is up to standards. Our guide said he has been interviewing for one of those jobs for over ten years. So, I guess I do not have much of a chance to join the ranks of the team. In the barroom (visitor center) they have a photo of one team of these experts and just darn lucky folks. At the end of the tour, you get to sample a number of the products, including some of the more expensive. Unfortunately, since we had to leave immediately after the happy hour, I had to pass, as the duty driver. Anneke, not a bourbon drinker, never the less stepped into the breach and had my share. Next we visited the Kentucky History Center in the heart of historic Frankfort. Here the history of the state was followed from the earliest times up to and including the current era. It is an easy and pleasant tour with many interactive displays. I am always looking for WWII war posters that I have not seen before, and sure enough they had one. All in all it was a nice way to spend several hours learning about the history of Kentucky. Finally, we stopped at the State Vietnam Memorial. It is designed in the form of a sundial. The shadow of the dial falls on the names of those who died, on the anniversary of their death. There are over 1100 names on the dial. It is an impressive sight.